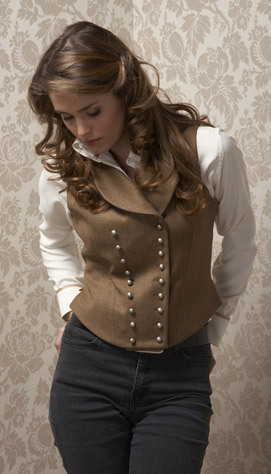 A beauty in this double-breasted shawl-collared waistcoat from Moloh. Bust – measure under arms over fullest part of chest. Waist – measure around narrowest part of torso at the navel. High hip – measure around pelvis approx. 4″ [10 cm] below natural waist. Back waist length – measure from nape of neck to natural waist. Armhole depth – measure drop from shoulder to armpit level. Shoulder – measure length of shoulder. Neck size – measure around base of neck. Dart Width Opening – 2 ¾” [7cm]. Square down from 0; square halfway across the paper. 0-1 = 5/8″ [1.5 cm]. 1-2 = armhole depth + 3/16″ [0.5 cm]; square across. 2-3 = half of bust + 2″ [5 cm]. Square up and down; label this line centerfront [CF]. 1-5 = back waist length; square across to 6. 5-7 = 4″ [10 cm], square across to centerfront line. Label point 8. (this gives ½ the high hip measurement plus 1″ [2.5 cm] ease). 0-9 = 1/5 of neck minus 1/16″ [0.2 cm]; draw in back neck curve 1-9. 1-10 = 1/5 armhole depth minus ¼” [0.7 cm]; square halfway across the paper. 9-11 = shoulder length minus 1″ [2.5 cm]; draw back shoulder line to touch the line from 10. 12 is center of the shoulder line. 12-13 Draw a dart 2″ [5cm] long and 3/8″ [1 cm] wide perpendicular to shoulder line. 2-14 = ½ back width + 3/16″ [0.5 cm] ease; square up to 15. 14-16 = half the measurement of 14-15. 17 is midway between 2 and 14; square down with a dotted line to point 18 on waistline and point 19 on hemline. 4-20 = 1/5 neck minus ¼” [0.7 cm]. 4-21 = 1/5 neck minus 1/16″ [0.2 cm]. 3-22 = 1/2 of back width measurement minus 3/4″ [2 cm] + half width of dart opening; square up. 3-23 = ½ of distance 3-22; square down with a dotted line to point 24 on waistline and point 25 on hemline. 26 is the bust point approx. 1″ [2.5 cm] down from 23; draw a line joining 20-26. 20-27 = dart opening; draw a line joining 26-27. 11-28 = 5/8″ [1.5 cm]; square out approx. 4″ [10 cm] to 29. 27-30 Draw a line from 27, equal to the back shoulder to touch on line from 28 to 29. 22-31 = 1/3 the measurement 3-21. 32 is midway between 14 and 22; square down with a dotted line to point 33 on the waistline and point 34 on the hemline. 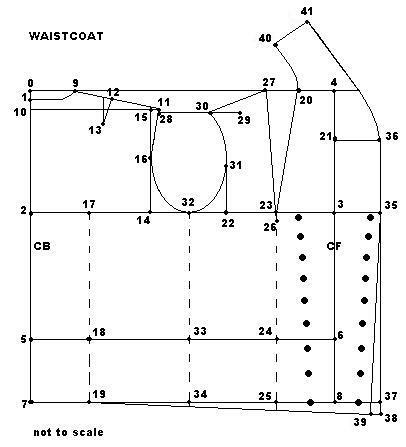 Draw armhole as shown passing through points 11, 16, 32, 31, and 30. When shoulder seams are joined it is essential that the armhole is a smooth curve. 3-35 = 3-23; square up to locate point 36 on line from 21 and square down to locate point 37 on line from 8. This is the double-breasted closure. 38-39 = ½” [1.25 cm]. Join 35 and 39 with a straight line. The waistcoat requires a front drop from 7 to 39; join with a gentle curved line to complete the hemline. Take a tracing of the back neck curve 1-9 and flip the shape over. Place point 9 of back neck curve on point 20 on front neck. 40-41 = 3 ½” [9 cm]; this is the CB of the collar. Complete the roll collar by drawing a parallel line to the neckline of the collar from 41 and gently curving into point 36 as shown. 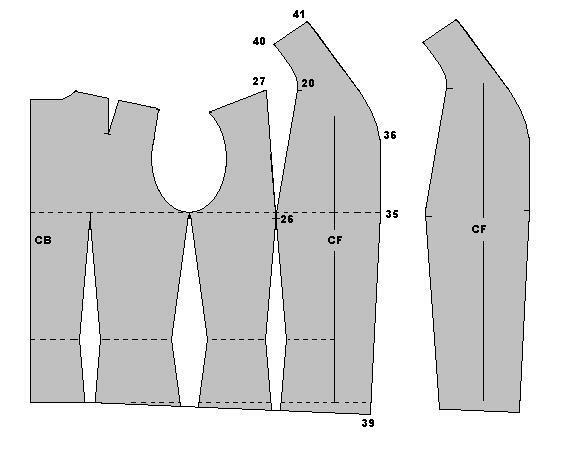 Shaping the waist of the waistcoat requires half the waist measurement plus 1-3/16″ [3 cm] ease. This means 4 ¾” [12 cm] shaping. Shape waist suppression on the dotted lines; 1-3/8″ [3.5 cm] at back dart, 1-5/8″ [4 cm] at side seam, and 1 ¾” [4.5 cm] at front dart. Close the bust dart by slashing the dotted line up to point 26 and match point 27 to 20. Mark 9 button placements evenly on either side of centerfront line for a double-breasted closure. Trace off the vest draft. 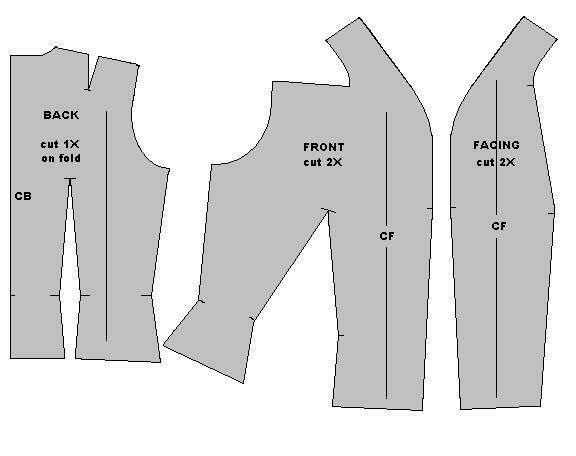 To make the front facing piece, separate the collar and front edge of the vest through points 25-26-20-40-41-36-35-39. The remaining pattern pieces will be used for the lining pattern. NOTE: Add seam allowance to all pattern pieces. Iron fusible interfacing onto back of collar & facing pieces, following manufacturer’s directions. With right sides together (RST), pin/baste front facing to front lining. Sew seam and press seam allowance towards lining. Topstitch the lining along the seam. Stay-stitch shoulder/neck point (#20) on collar facing to reinforce corner. 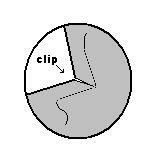 Clip seam allowance to the stitching at a 45° angle. Pin/baste waist suppression darts on back lining. Sew darts and press towards the sideseam. With RST, pin/baste lining fronts to lining back at sideseams and shoulders. Sew seams and press open. With RST, pin /baste CB seam of top collar together. Sew seam and press open. Then pin/baste the collar neckline to the back lining and sew between the two clips. Press seam towards lining. Topstitch lining along neckline seam. Set aside. Stay-stitch shoulder/neck point (#20) on waistcoat fronts to reinforce corner. Clip seam allowance to the stitching at a 45° angle. Pin/baste waist suppression darts on back and front waistcoat sections. Sew darts and press towards the center. With RST, pin/baste fronts to back at sideseams and shoulders. Sew seams and press open. With RST, pin /baste CB seam of under-collar together. Sew seam and press open. With RST, pin /baste neck edge of collar to back neckline of waistcoat. Sew neck seam between the two clips. Press seam open. Place the lined portion with the outer portion of the waistcoat with right sides together, aligning them up along the outer edges. Pin/baste the two halves of the waistcoat together. Stitch the waistcoat along the front edge and collar. Grade seams and clip seam allowance along curved edge of collar. Press seam open. Pin/baste along the lower edge of the waistcoat from the front edge to the sideseam matching up the waist darting. Sew lower edge of front and press open. Trim corners and grade seam allowance on front facing. Turn the waistcoat right side out. Use a point turner to gently push out the edges of the garment and make sure it is fully right side out. Entering from the bottom, match up the seam allowances of the armholes and sew lining around the armholes. Do a parallel row of stitching 1/8″ [0.25 cm] on armholes and trim seam allowances away. Then, match up the seam allowances of the back neckline and collar and baste together. Turn the bottom edge of the waistcoat so that the back hemline is even with the rest of the front. Press the folded hem. Turn the bottom edge of the lining and lay on top of the hem just shy of the fold. Baste the two layers together. Slipstitch the lining to the back. Under-stitch along the armholes, 1/4 inch [0.5 cm] from the edge. Press the outer edges of the waistcoat. Under-stitch the front closure and under-collar 1/4 inch [0.5 cm] from the edge. On the right hand side front, thread-mark 9 buttonholes (5/8″ diameter [15 mm]). Sew buttonholes. Hand-stitch 9 shank buttons to the left front of the waistcoat following button placement on draft. To create the double-breasted “look”, on the right front sew 9 more buttons (mirror-imaged on CF line) in a slight V-formation, as shown. This is beautiful- I think I’ll have to make it for my daughter. Do you think if I elongate this creation to be hip level , will it affect the overall look ? Do you mean 9-11 = HALF shoulder length minus 1″ [2.5 cm]?? re-measure your shoulder… you will find it is 4 1/2″ to 5 inches in length. with that explanation, i’m confused as to where the half-waist measurement comes into play. Hi Kara: No problem… the half measurement is used because you are only drafting half the pattern…as for the ease it may differ from one person to the next; the amount given is only a guideline as to how you might distribute it. Thanks for this pattern, so beautiful. Difficult to found THE waistcoat, all I saw in the internet was… beaarg. Thanks thanks. I hope I easily can make it, I’m French, traduction was hard ! Okay, so this looks awesome, and I’m going to look at it more closely, but this line “measure around narrowest part of torso at the navel” just sort of stopped me in my tracks because the absolute largest part of my torso/hips happens to be exactly at my navel. Which is 12 inches more than my waist. Sooooooo, yeah. Go curvyness. Love what it looks like in the photo though. I’d just have to tailor it heavily perhaps. i love this waistcoat it’s exactly what i needed, but when my friends and i were drafting it we all came upon the problem that point 16 was further in than point 11 making the armhole impossible we checked multiple times to make sure all our measurments were right. is there a way to fix this?